Open the Settings page under Connect to manage your contact addresses. 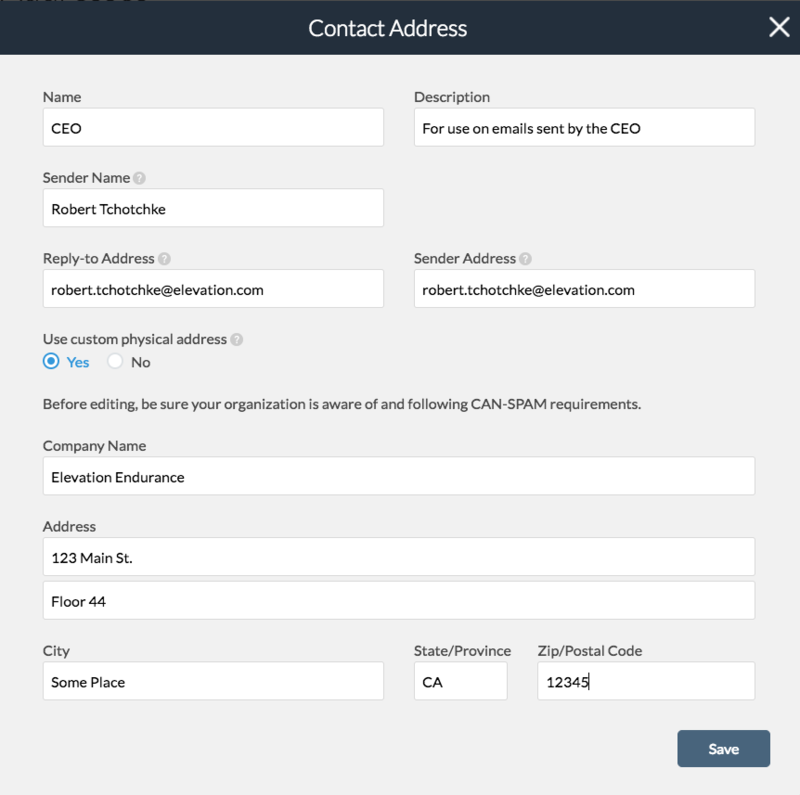 Adding contact addresses to your program creates a list of sender/reply-to for your studio users to choose from while creating or editing an email campaign. For example, you may want a generic contact address for program-wide email campaigns and a marketing-specific contact address for email campaigns targeted to the marketing team. You can also designate a default address to use for new email campaigns. Note: Even if you use contact addresses, you will still need to whitelist the original sender, SocialChorus, as outlined in the article about Whitelisting SocialChorus Emails. Select Create in the top right of the Connect > Settings page. Fill out all the fields and Save. Name - Only visible to program managers. Description - Only visible to program managers. Sender Name - The name that appears on emails in users' inboxes as the sender of the campaign. Reply-to Address - the email address to which users can respond with questions or feedback. Sender Address - The email address that appears in users' inboxes as the sender of the campaign. Custom Physical Address - Defaults to No, which uses the SocialChorus headquarter's address. If you switch to Yes and enter a custom physical address, the address is required to be CAN-SPAM compliant. If you encounter this warning, please review the instructions under Configure Trusted Sender so that you can configure the custom sender using your email domain. Click on the three dots next to an active contact address and choose Set Default. The default contact address will be the the default selection for new campaigns. You can only designate one contact address as the default at a time. The Program Manager creating or editing an email campaign can choose a non-default contact address if one is available. You can Archive or Restore contact addresses at any time. This will not change the sender/reply-to of email campaigns that have already been created. Archive will only change what contact address is available for selection when creating a new email campaign or editing an older email campaign.